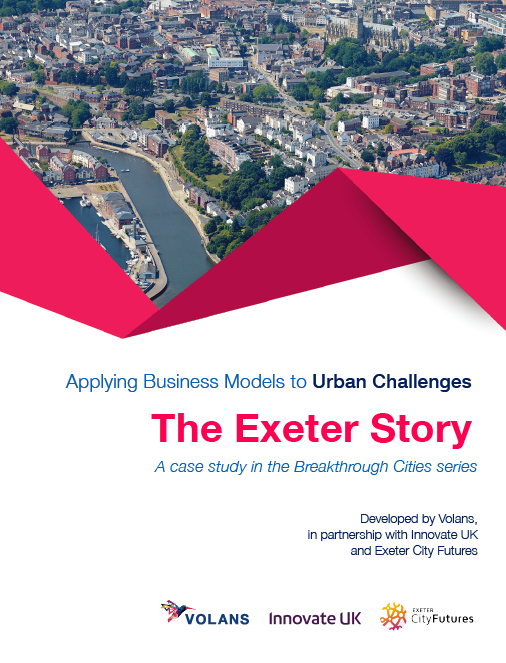 The latest report in Volans Breakthrough Cities series, developed in partnership with Innovate UK, explores how the city of Exeter in southwest England is applying the principles of breakthrough innovation. Download the full report. Late last year, Volans, Innovate UK and Exeter City Futures convened a workshop to explore what it looks like when the 7 principles of transformative urban innovation outlined in Volans previous report, Business Models for Solving Urban Challenges: An Action Guide for City Authorities and SMEs, get applied to real-world challenges. Off the back of this workshop, plus a number of interviews with key stakeholders, Volans have written a new report to tell ‘The Exeter Story’. Exeter was selected for this in-depth case study because, in recent years, it has been a pioneer of cross-sector collaboration to transform the city. Exeter City Futures, an independent Community Interest Company that brings together both local government and the private sector to help solve the city’s urbanisation challenges, has been at the heart of this collaborative approach. The report explores how Exeter City Futures, in partnership with the City Council and others, has defined a ‘Massive Transformative Purpose’ (MTP) for the city — namely, to become congestion free and energy independent — and how this MTP is now acting as a launch pad for a whole host of innovative projects. The city is making extraordinary progress at a time when it, like every other city in the country, faces significant headwinds. In Exeter, a city of 130,000 people, something is working. Volans have tried to distill the essence of what that something is, in order to provide inspiration and practical advice for other cities around the UK (and the world). Cities are crucial to our collective future. If we’re to solve the massive challenges humanity faces, replicating best practice from city to city is crucial. So, whether you work for a city authority, or a business, or are simply a citizen with an interest in making your city a better, more sustainable place to live, we encourage you to read the report, learn from it and apply its lessons.